Congress is now back in session. But, will they act for a healthy Gulf? Next Tuesday, December 7th, please make a call to tell Congress that the Gulf needs a Regional Citizens’ Advisory Council to help prevent future disasters and that Clean Water Act fines paid by BP should go towards restoring the coast. We need all hands on deck for Gulf Coast recovery. Pick up your phone and make a call to your legislator! Who is your Senator? Go here. Who is your Congressperson? Go here. Ask to speak with your Representative/Senator. They should transfer you to their office, and if they are not available, just leave a message with the operator or secretary. Then you can use the talking points below. * Hello! My name is ________________, and I’m calling to ask (Representative/Senator)_ to make a commitment to the Gulf. * The BP Drilling Disaster spewed 180 million gallons of oil and tons of toxic dispersant into the Gulf of Mexico and much of it is still out there. This disaster is severely impacting the jobs, lives, and futures of millions of Gulf Coast residents. * In response to the disaster, I urge you to support the creation of a local Citizen’s Advisory Council that will give Gulf citizens a voice in making sure the oil industry does not repeat the mistakes that lead to BP’s Drilling Disaster. * Also, please hold BP accountable for their violation of the Clean Water Act and guarantee that the penalties are used to fund restoration efforts in the Gulf of Mexico. * It will be a long road to restoration, and the government needs to stay focused on the disaster and environmental impacts that are just beginning to play out. It is the only way to ensure that the people and places affected by the disaster are made whole again. Thank you. 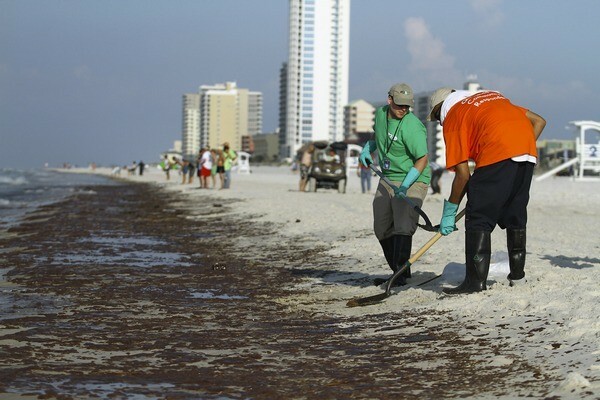 Gulf Shores During Spill. Photo: Lyle W. Ratliff/ Reuters.